Machine pieced and quilted, hand quilting on the green maple. Made using Massive Maples tutorial by Darcy Childress at Modern Cozy. A few years ago, one of my West Atlanta Modern Quilt Guild buddies, Darcy (of Modern Cozy) posted this quick and graphic quilt, taking the classic maple leaf and blowing it up large. 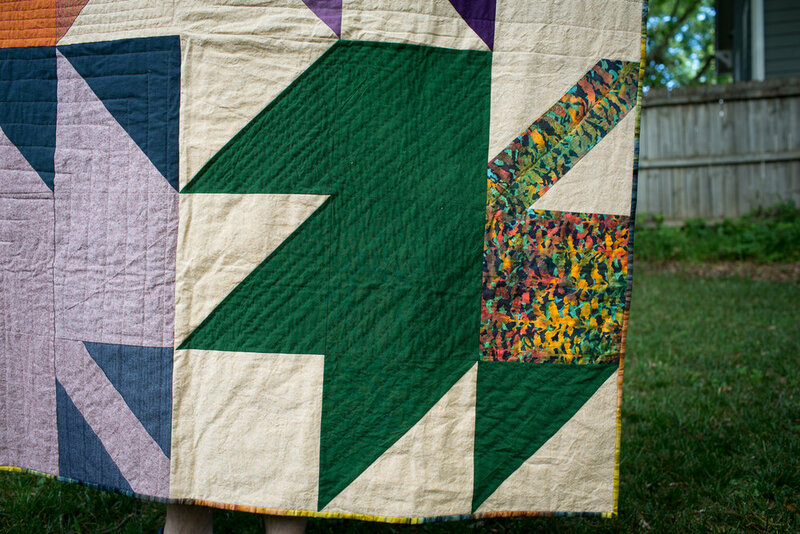 I thought of it when my mother-in-law requested a quilt for her to use while reading in bed, napping, and other reasons to have a good solid throw quilt, and it fit perfectly because she requested "earth tones"--not typically my color palette. I set about interpreting earth tones in a way that still felt like me, and used some shot cottons and Essex linen and yarn dyed linen to that effect. This really does come together quickly. I hand-quilted the green maple leaf, and pulled that quirky batik-looking fabric from some stash I inherited from my mom. My mom was also there to talk through some ideas early in the planning stage, which is when we found the wonderful backing/binding fabric, in those murky tones, striped like surreal water, while wandering Jeri's Quilt Patch (Norway, Michigan) last year during our visit to the U.P. I used that as the starting point for the colors and aesthetic for this quilt. From the time I began the thought process on this one, several quilts came up that had priority first, including Casey's quilt, which he commissioned, and a baby quilt for my sister-in-law who was expecting her son, and a few other projects. So while this was originally meant to be a Christmas gift, it was a mother's day gift instead. Green and purple shot cottons were picked up during our trip to Portland in December, at Cool Quilts. What a wonderful and well-curated small little shop! Both the quilt shops included in this quilt's process operate out of old, charming houses, with rooms of bolts and bolts and notions in the hallways. The green pearl cotton used to hand quilt the leaf was a gift from my brother Paul and his wife Brittany, in the most perfect, Harry Potter-esque ink bottle green.